Father's Day card - Clear embossed masking! I used the clear embossing technique to stamp and mask the white leaves, then I stamped the background with lots of different stamps, using a couple of colours. The sentient is stamped onto a piece of vellum and cut out using a thin die, which I attached using my trusty old Crop-o-dile and two eyelets. Happy crafting and thanks for stopping by today. ColourQ Challenge #295, Silhouette Cameo & Minc! 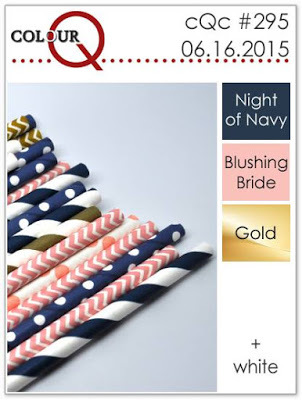 I'm back today with another card that I'm entering into this weeks ColourQ challenge. The colours were not as easy for me this week, which actually is more challenging and I'm pleased with the result! I used my Minc foiling machine! I'm still not quite up to speed with it, there was a crinkle (or two) in the foil which left a couple of small areas unfoiled, I'm hoping you won't spot them ;)! 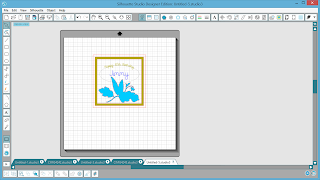 I used the Silhouette Studio software to design the card. Using the Print & Cut feature, I printed the circles and the sentiment and then cut round them with my Silhouette Cameo. The stamp set and punch used for the flowers were from Stampin' Up, as was the little heart punch. All the colours were as the challenge suggested. Hope you get a chance to craft today and thanks for stopping by. ColourQ Challenge #294 with Watercolor Wings & Silhouette Cameo! I often check out this colour challenge site and as soon as I saw these colours, I thought they were great and wanted to use them right away. I decided to make one of these little 2 page mini album cards. I made one a while back and fancied making another one. I used three new stamp sets from Stampin' Up - Watercolor Wings, Awesomely Artistic & Floral Wings. I cut the mini album on my Silhouette Cameo, the file was from the Silhouette online store. I've got another card sketch for you today, another one I found and liked on the internet :)! 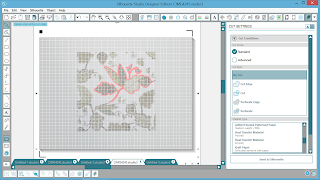 I used my Stampin' Up marker pen for the detailed stitching around the tree, in my Thyme Graphics pen holder tool which is inserted instead of a blade in the Silhouette Cameo. Hope you like my cards for today. I don't usually use pink colours on cards I send to her, she's a red head so I usually go for yellows and greens but I wanted to go girlie for her today, so pink it was! 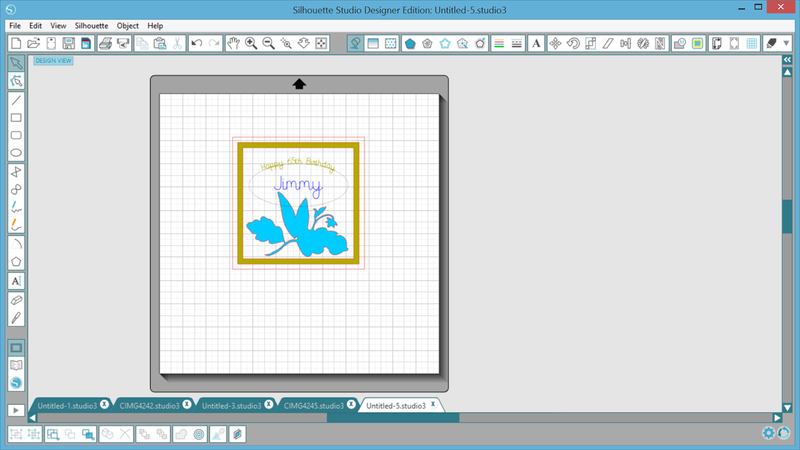 I started off by finding a card sketch on the internet I liked and followed it using the Silhouette Studio software. 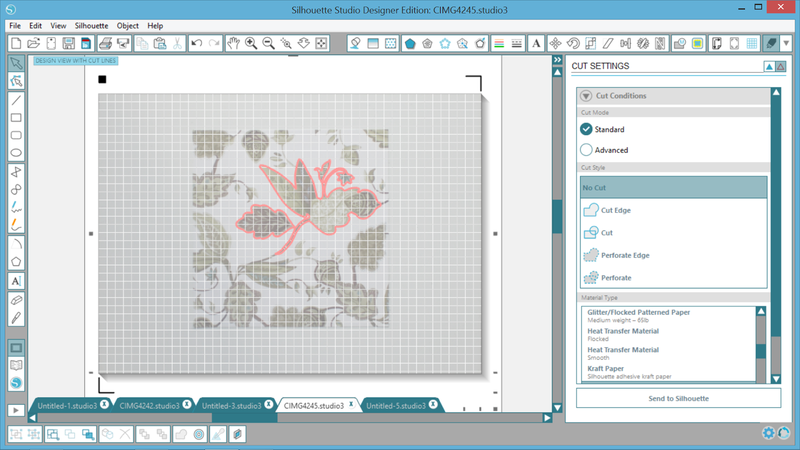 I liked the idea of the scalloped edge on two of the squares, which I enjoyed designing in the software from scratch. The butterfly image was from the Silhouette online store, I used paper from the Fairy Belle Collection by Prima, the tiny flowers were from my stash and the card stock is from Stampin' Up. I hope my daughter likes her card this year and hope you do too ;)! I was supposed to be teaching one of my Silhouette lessons today to a lady, who has been hit by a stomach bug, unfortunately. I do hope she gets better really quickly. I'd set up my teaching area and got samples of paper ready to give her a quick PixScan demo at the end of the lesson. As I found myself with spare time today I thought I'd have a play with my PixScan mat and a piece of the paper I'd chosen to demo. I cut the image and afterwards copied the cut file into a new file, filled it with a random colour and designed the card around the image. I hope you like the finished result, I'm really pleased with how it turned out. I love m PixScan mat, I really should use it more ;)!